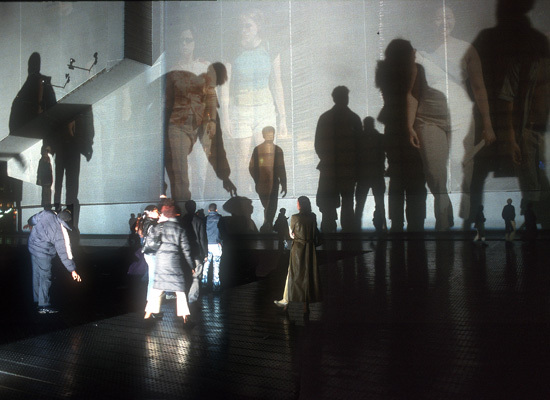 Here are some snapshots of Body Movies by Rafael Lozano-Hemmer, certainly one of the most extraordinary public installation or, to use the artist's preferred phrase, “relational architecture,” we have ever come across. See this video of its first installation in Rotterdam. 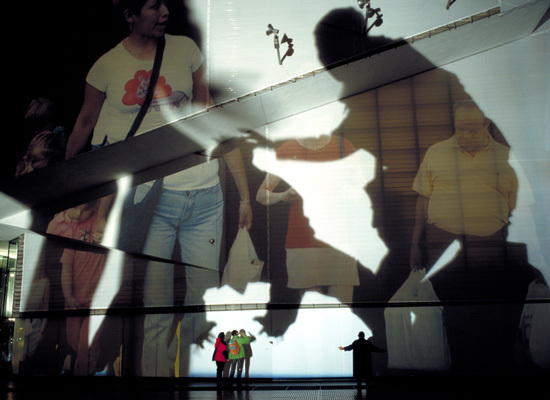 From Joke Brouwer & Arjen Mulder's TransUrbanism: “Over one thousand portraits — taken on the streets of Rotterdam, Madrid, Mexico and Montréal — were projected on the façade of the Pathé Cinema building using robotically controlled projectors located on towers around the square. The portraits could not be seen when the square was empty because powerful xenon light sources placed at floor-level completely washed them out. 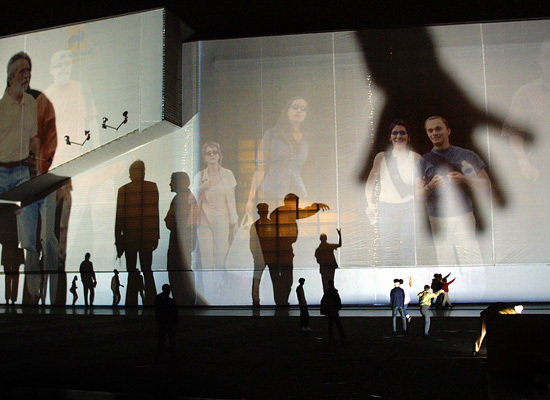 As soon as people walked on the square, however, their shadows were projected on the building and the portraits were revealed within them. Passers-by could move around and match the scale of a portrait by going toward or away from the building, making their silhouettes between 2 and 22 meters high. 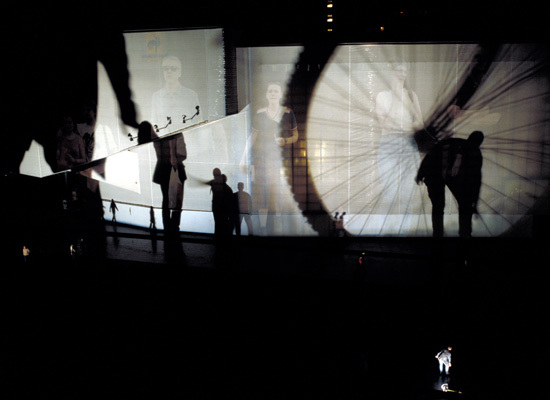 A camera-based tracking system monitored the location of the shadows in real time and, when the shadows matched all the portraits in a given scene, the control computer issued an automatic command to change the scene to the next set of portraits. This way the people on the square were invited to embody different representational narratives." 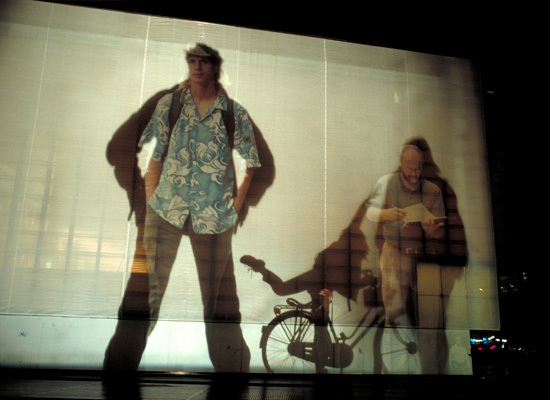 Body Movies was first installed in 2001 and then later in 2003 in Duisburg, Germany. It's most recent showing, one could argue, was this week, today, this night even in Paris. The city is burning. There are riots. But not from within as is usually the case in American cities when the marginalized erupts from decades of disaffection and the interior takes on the appearance of Mogadishu or Fallujah. In Paris, the fires burn along the periphery, in the suburban “ethnic ghettos” of largely African and Arab migrant communities that encircle the French capital. The City of Light ringed by flames. Cars, buses, shops, and maybe even trees are burning on streets disconnected locally from Haussman's boulevards yet ironically still connected globally via immigrations. And out of the pyres, shadows emerge, penumbral, cast off onto public housing highrises zoned out from fin de siècle arrondissements. No façade remains bare. But these shadows are not “the expression of a hidden monstrosity or otherness,” rather the expression of disenchanted, very angry youths. If Lozano-Hemmer intended with Body Movies to instill a sense of ownership of public spaces through engagment, then its grittier and lo-fi Parisian version narrates the repressed attempting to colonize a piece of the territoire. There's something peculiar about making reference to fire and flames in a discussion of flickering shadows cast upon the walls of modern cities. Fire is about purification, and the fires of metropolitan France are a sort of ritual cleansing, but whose aims may be equally about the kind of cleansing that produces a scorched earth from which new landscapes develop, or the kind of fire that clears away the accumulated detritus for a clearer view of existing features, or the kind of fire that simply illuminates our shadows against the backdrop of what we make. The casting of shadows evokes that cleansing fire, but also makes the point that it is each of us in our contribution to the collective process that makes cities places of another sort of fire.